Via Stuart, via Boing Boing, woot's runner up in an American T-shirt design competition features a Tube map style diagram of the digestive system. However, I do like the description from the designer, Jack Anderson: "You're trying to get to the liver? See, what you wanna do is take the red line past the stomach, then switch trains at the small intestine. Green line'll take you right there. Oh, you need to get to the appendix after that? 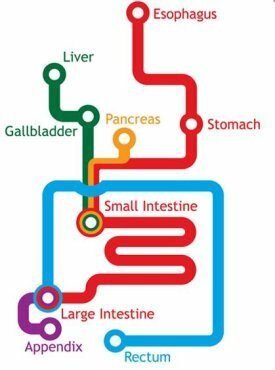 Get back on the green line, back to the small intestine, switch to the red southbound, then get off at the large intestine station. The purple express goes right to the appendix. Whatever you do, stay off the blue line. It winds up in a pretty bad neighborhood." "Single Tube, bus, DLR and tram fares will be frozen from January 2008, as we look to share the city's economic success with our passengers. "Record passenger numbers and careful control of operating costs have boosted transport revenues. Following the recent 10 per cent reduction in single bus fares, by freezing cash fares for 2008 I am now ensuring that the benefits will be felt by millions more Londoners." 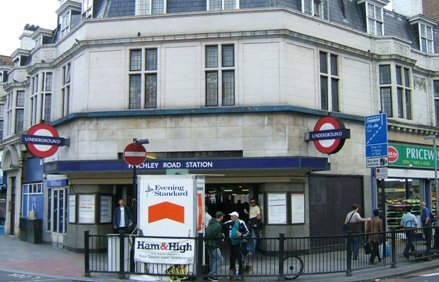 London's Transport Commissioner, Peter Hendy, said that Tube carried more than a billion passengers for the first time last year. 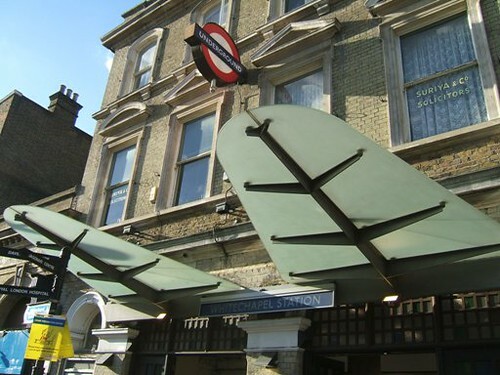 From Ken's press release we learn that "The average real tube fare has only risen from £1.41 to £1.43 - that is an increase of 1.4 per cent a year over eight years, or an average real increase of 0.2 per cent a year. Tube fare revenue is projected to increase by 11 per cent this year - from £1,417m last year to £1,570m. 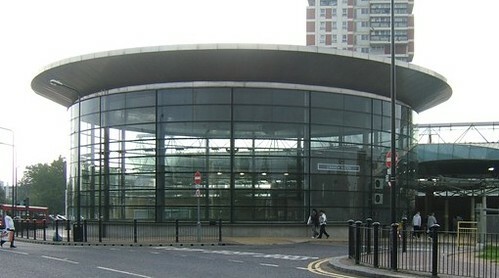 Single Tube fares are also frozen, with the price of a single journey in central London being held at £1.50 when using Oyster, and £4 when paying by cash. A little over three per cent of Tube fares are now paid in cash." However, in reality this might be just a bit of a spin for a number of Londoners (like me) as One Day Travelcards and Travelcard Season Tickets will rise in line with inflation. That's because these tickets also apply on National Rail, and Ken and Pete haven't got the agreement of the Train Operating Companies for lower fares. To work out whether Oyster Pre-Pay or a Travelcard is cheaper for you - try James Cridland's handy Oyster-or-Travelcard-calculator. Today, I was incredulously reading the story of the NFL player, Channing Chowder, who claimed not know until this week that people in London spoke English. The story initially came from Palm Beach Post's blog where I found a post about the reporter's trip on the Tube. "Exit signs that say 'Way Out', instead of exit. Must be leftovers from the '60s." I'm assuming this is a joke and he's seeing Way Out in the groovy "Way Out man" way. 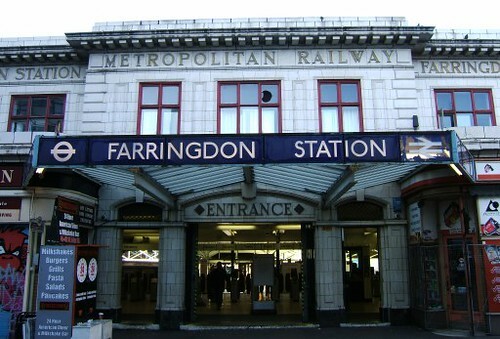 I also like the general way that tourists think Tube station names are funny. 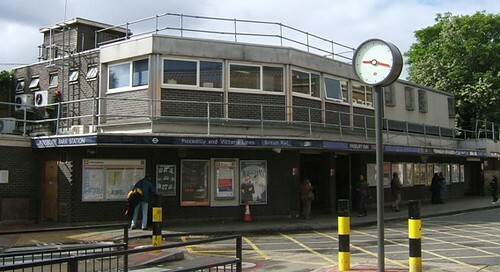 "Funky station names like Mudchute, Tooting Broadway, Canada Water, Barking and Pudding Mill Lane." 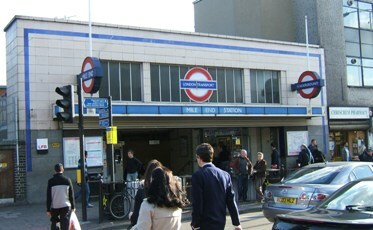 Although Tooting Broadway wouldn't make it onto my list of funky names. He ends with making the cardinal sin of talking to people and asks baseball cap wearers whether they actually were American. Unsuprisingly none of the people with New York Yankee caps, Boston Red Sox lids & Miami Heat jackets hailed from the US. Anyway I hope all of us commuters will be model Londoners and helpfully give puzzled looking Americans directions, if they ask for help. Amazingly over 80,000 people are going to watch the Miami Dolphins play the New York Giants today. Make sure you've got a translator at the ready in case you bump into anyone like Channing Crowder. 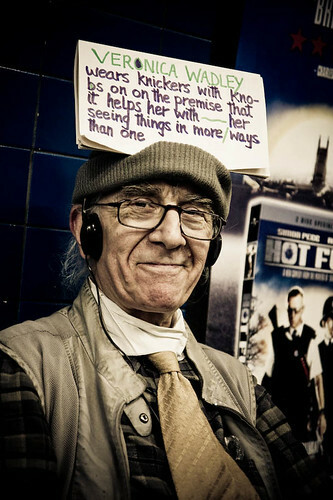 First, there was "isawyoutoday.com" for people who'd experienced a James Blunt "You're Beautiful" moment and seen someone they fancied on the Tube & wanted to get acquainted. Metro used to run a weekly Commuter Cupid corner. Londonpaper now run this every day complete with blog. There's a Facebook group with over 100 members for people who "temporarily fall in love with people on public transport". Now there's more commuting dating sites than you can shake a stick at and to top all this a few days ago Germany launched train speed dating. Rail operator Deutsche Bahn is helping singles to find that special someone, as they look for romance on the railway. The singles are divided into the two groups, the over and the under 30's, and have a series of "speed dates", all while travelling from Nuremberg to Munich on an intercity train. Each traveller has ten minutes to chat before moving onto the next target. "A trip on the single express may be just the ticket for a new romance" gushes the presenter at the end of the video above. Over to TfL for what could be a nice little earner for the Tube. Pack a load of singles with red roses & glasses of sparkling plonk on the Northern Line and get them to talk to each other when the trains stop between tunnels. You then swap seats when the Tube moves again. You'd easily have more time alloted to you than on a normal speed date. "I got talking to him because I really wanted to know what he was all about, but he was very cagey with the details. I did manage to win his confidence enough for him to allow me to take his photograph, which is something he never does, apparently. He denied that he was an eccentric or a character, but I'd say the evidence points to the contrary." 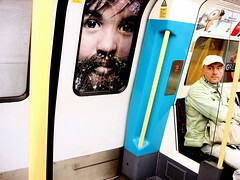 If anyone else spots him on their travels on the Tube, please be send me a picture. Thanks to Mr Jam for sending this. 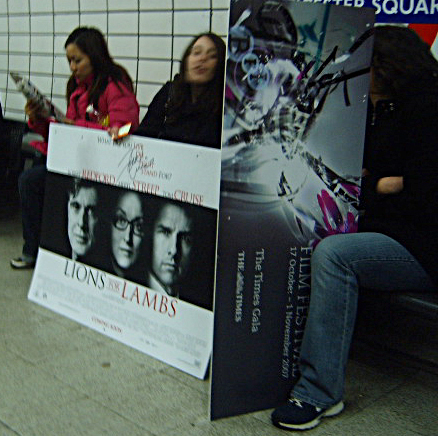 I couldn't quite see who had signed the placard, but as Tom Cruise seems to spend about two hours doing walkabouts at premieres these days, my money's on him. 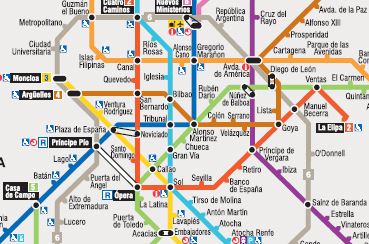 Thanks to Max Roberts for giving the heads up to the FT's weekend feature on Madrid's reaction when their subway map was changed earlier this year. The map was "replaced by a new plano esquematico, with stern horizontals and verticals, produced by a local design agency. Reaction was furious. 'It's a monstrosity,' said one complainant. 'Idiotic and unnecessary,' said another." However, if you know Madrid there are some unsettling oddities. According to the FT, the designer, Rafa Sanudo, makes the standard Line 1 journey from Pinar de Chamartin to Valdecarros "seem as though you're on some weird escalator". Max predicts: "It will last three or four years, until the person who commissioned it moves on. Then they'll change their minds." I'm sure we'd get a similar "up in arms" reaction from the UK if the Tube map lost its curves & 45 degree angles and went all spiky overnight. Even Max's own curvy Tube map bought mixed reactions when blogged here. 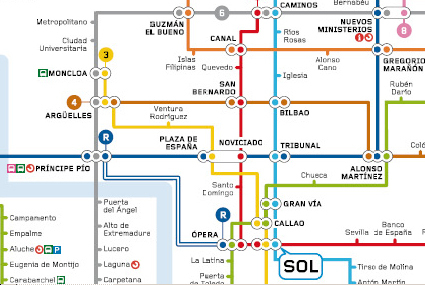 Apparently Madrid's map "has slipped the surly bonds of reality completely. All diagonals are banned, which makes it very uncompromising." But my favourite part of this story is hearing about the guinea pigs that the map's designer, Rafa Sanudo, used as a sanity check for the map: "He said he tested it on his mother-in-law and her bridge partners, which sounds as good a focus group as any other, and cheaper than most. But perhaps they don't get out much." Check out the full FT feature here. 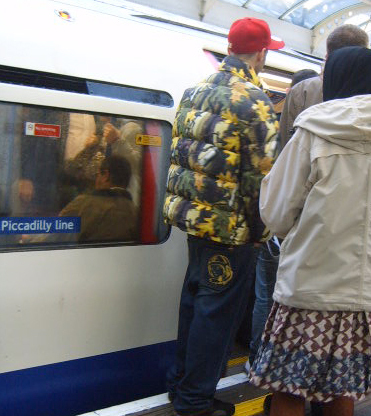 It's Friday, time for another look at commuters on the Tube who could be considered victims of fashion or have certainly taken a style and made it their own. You can tell it's getting colder when the Uggs are out in force. She's gone for the full Paris Hilton look with the micro mini skirt and the boots which are more appropriate for Russian steppes than the steps of an escalator. 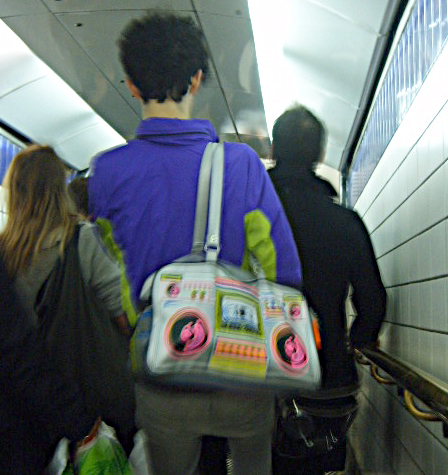 I also like the hardy rucksack with it's "scooby doo" key chain / bag jewellery and the glitzy sequinned gold accompaniment. Speaking of escalators, they put you at a great vantage point to spot people who've left the labels on the soles of their shoes. Yeah, I know that doesn't make you a "fashion victim". But it does spoil your nice cropped Twiggy trouser look and Top Shop shopper bag. It would have made a great camouflage jacket if he'd decided to lie in an cartoon forest. Unfortunately, you can't see from the picture very well but there were little monkeys hiding amongst the leaves. Also loving the astronaut on his jeans pocket. All very Neil Armstrong meets Walt Disney. Is it a man bag? Did he raid a toy shop? Is he being ironic? Is it all out kitsch? Who knows. 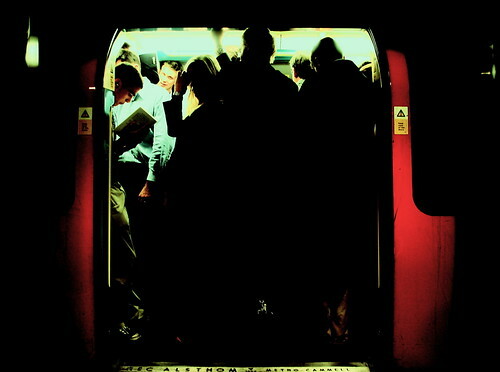 "Like most users of the tube, I have my own little ritual to get through the journey. Whilst most scuffle around for a stray copy of one of the freesheets, dig into the latest best seller, switch on their iPods, or switch off completely, I'm keeping my eyes peeled for a route onto the Surreal Line. "You won't see it on any official Tube maps. Or ones those enthusiasts keep of abandoned tunnels and disused stations. The ticket office won't tell you what zones it occupies. Tube drivers won't make any mention of it when they call out connections. Platform staff, they just shrug and look back at you blankly. 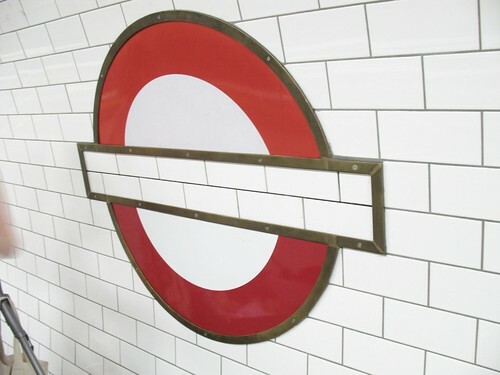 Eyes glazed over as you explain you once saw a connection on the Bakerloo line. Or was it the Jubilee? Fellow commuters? Pfft! 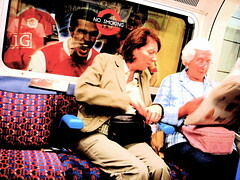 First rule of Tube travelling is, you don't talk. In spite of that, every now and again though, if I'm lucky, I'll catch a glimpse of it. I know it's there… except sometimes it isn't! It's a bit like trying to find ways into Narnia... the entrance is never the same, and once used, it disappears completely. "Please believe me, I've been on the Surreal Line. Sometimes for mere seconds, other times for maybe a minute perhaps even two. I can't explain how it happens, or why, but in the blink of an eye, I'm suddenly there! 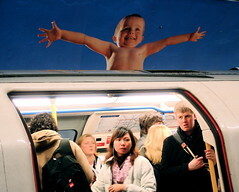 Sitting in one of its trains, or standing on one of its platforms, slightly befuddled as I watch a baby leap above a crowded carriage of bored commuters. On other trips, I've seen a woman waft a man with handfuls of cash, a giant offer a businessman a plateful of jelly and a mischievous squirrel attempt to leave a box on a man's shoulder. I've sat in a train and been eyed up by gawping giants. Watched a pair of eyes roll by the carriage windows, sneaking a peak at a commuter's paper in the time-honoured tradition. Before I can point this out to anyone, as if by magic, I'm suddenly back again. Like Mr Benn, with a token souvenir of his dressing room travels, all I have left are these pictures. 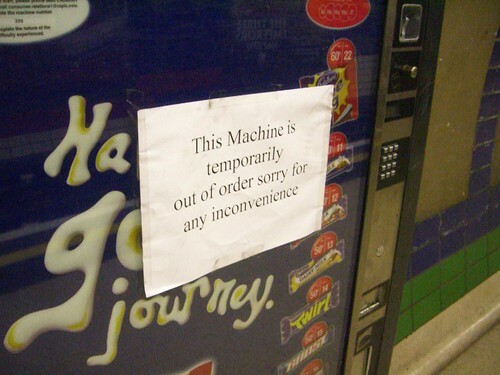 "Around Easter time this year, every single Cadbury's chocolate machine on the Underground - at least, every single one I've seen over the last six months or so - has been taken out of service. Some have been removed entirely, some just sit there, their fronts turned inside out with a 'This machine has been taken out of service' sticker. I had noticed that in the last few months before their demise, they'd been rewarding me with chocolate without me paying a penny. I'd got two packets of Mini Cream Eggs this way, and at Westminster I'd put a pound coin in, only for it to come straight out again...but gave me some chocolate anyway! Even so, getting rid of the lot seems a bit extreme, surely, it's ending a century of tradition. I was at least comforted with the Coca Cola machines still working, at £1 they were actually cheaper than a lot of other places that sell them...except in the last few weeks these seem to have gone as well, I usually get a bottle from Green Park but they've vanished! Now I have to try and remember before I go inside a station to visit the newsagent first, it's much less convenient though. Any ideas why they've got rid of them, and do you know if they'll ever be back?" First of all I thought he was wrong and he was referring to a point when the chocolate machines were faulty & were melting the chocolate. But then I spent one evening coming home deliberately looking at the platorms where I knew there were machines and he was right, they had gone. Now to be honest losing Cadbury's machines isn't a great hardship for me as I hate Cadbury's chocolate. The fact that it's taken me months to even notice they were missing also shows I'm not going to mourn their passing. Like many people I've also lost count of the times my money has been swallowed by those machines, with no chocolate in return. But like Billy I wonder if their disappearance is permanent? Has the concession gone to Mars instead (which would be a result for me)? 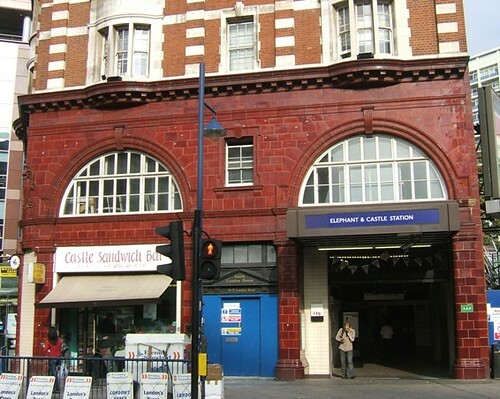 Will we ever see Tube platform chocolate or drinks machines again? This doesn't mean it's fine to put your feet on Tube seats, but that putting your feet on Tube seats means you can get a fifty quid on the spot fine. The same's also true for playing your music too loudly. Senior officers from the British Transport Police say that people feel intimidated by "low level bad behaviour" and that it also leads to more serious disorder and to clashes when troublemakers are confronted. 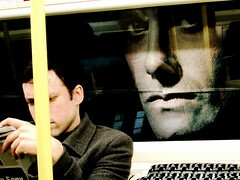 Extra officers will patrol London transport to help reduce fear and cut crime. Apparently the fines will vary according to the offence, but can be as much as £80, and they will double if not paid within 21 days. 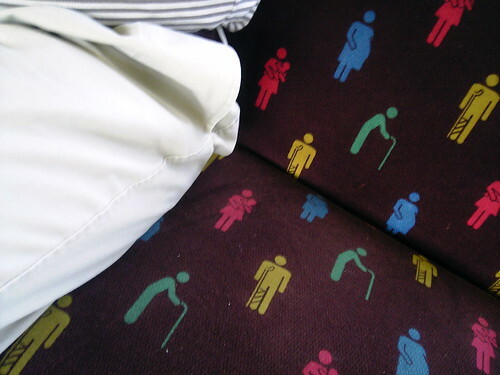 However, this doesn't mean that all people with their feet on seats or loudly playing iPods and the like will be fined. The Evening Standard wrote: "Some passengers, particularly those judged to be acting "thoughtlessly" rather than deliberately offensively, will be initially be given a verbal warning and told to improve their conduct. 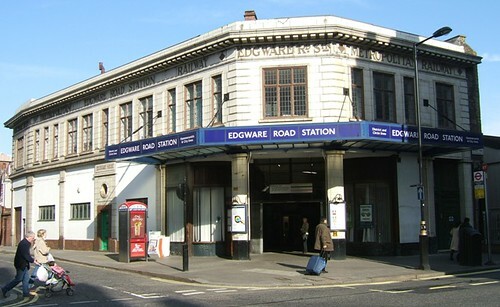 The drive against antisocial behaviour forms part of wider attempt by Transport for London to improve passenger safety. To achieve this, it has drawn up a new Community Safety Plan which lists the reduction of anti-social behaviour and the fear of crime among its key targets for the coming year." Unamed commuter groups have welcomed the move and they're also looking for a beer ban on London's transport. 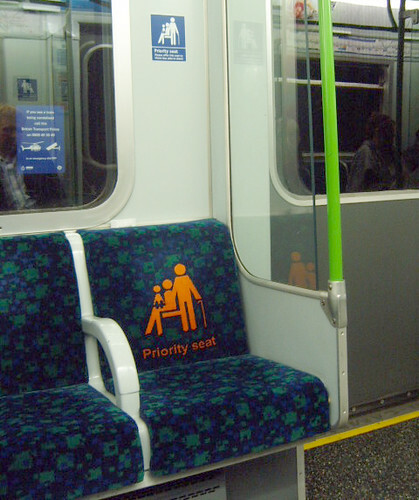 Not content with the sign on the glass above them, some "priority seats" have the bright orange "give-up-this-seat-to-someone-who-needs-it-more-than- you" icon emblazoned on the seat upholstery. Although admittedly if I saw a jaundiced looking man with a seat growing out of his leg and a woman with a young child attached to his arm, I'd move out if his way pretty sharpish. Before we pat London on the back for being innnovative, it looks like we are behind the Japanese with this, who've gone for a more subtle approach. 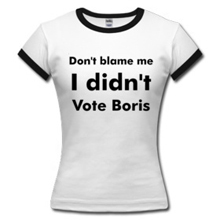 Probably too subtle for many people. Looks like the London Undeground itself liked the quiz run on the blog a few weeks ago where station names were blanked out. As an experiment it appears they decided to incorporate it onto the network. Karl took this photo and said "Where am I? Imagine pulling into this station as a tourist or with English as a second language - no, hold on, it doesn't matter what language you speak - unless you can telepathically communicate with the sign." If anyone would like to make any guesses as to the station Karl pulled into, please leave them in the comments below. 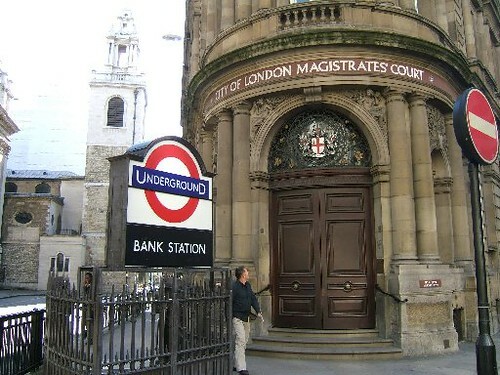 Let's hope in the meantime that TfL have managed to fill in the sign. It's not a publicity stunt by Mayor Ken, and I certainly feel sorry fo the rest of the world, but apparently London has the best public transport system on earth. Even though it was considered the most expensive, (no surprises there then) worldwide vistors to a TripAdvisor poll voted London as having the safest public transport, the best subway system and the best taxis. New York was runner-up to London as the best for public transport and was also second most-expensive. Michelle Perry, TripAdvisor's communications director, said "For the second straight year, London and New York were tops for public transport among travellers. As they also rate as the most expensive among travellers, it's proof that even when it comes to riding a bus or a subway, you get what you pay for." Mmmm an overcrowded, delayed, badly in need of repair, hot, strike happy service as far as the Tube is concerned. Just over 800 people completed the poll, which is hardly representative of the "world's" travellers. However, they seemed to have a bit more sense when it came to voting on cleanliness when London came fourth. Washington won this category. Never one to seize an opportunity to boast about London's Transport, Ken Livingstone said to the Independent "What we are seeing are the fruits of real and sustained increased investment in London's public transport, a break from the previous policy of deregulation and choking off resources. "London has achieved a unique shift in journeys from cars to public transport, a 40 per cent increase in bus ridership, cleaner engines for buses and taxis, traffic down in the city's centre, and 83 per cent increase in cycling, and the biggest transport investment programme since the Second World War." If you want to see more from the 800 poor deluded folk check out Female First. Also if you have any views on which public transport system you think is the best in the world, please leave your thoughts in the comments below. 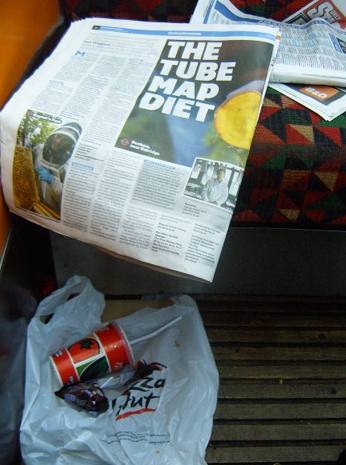 It was ironic that I saw the londonpaper's story about the Tube Map Diet in a carriage where the remains of a real Tube Diet were left behind. A Tube Map diet isn't about surviving on left over pizza, rat kebab and pigeon pie. It's the challenge to spend a week only eating food that is grown or reared within the spread of the London Underground map. It's not too easy but he manages to find a couple of city farms, some farmers markets and some honey produced in Regent's Park. He could have tried the other challenge of surviving on food from Tube stations. Unless you're lucky enough to use a station with a Marks & Spencer's in it, you're stuck with newsagent fodder or the odd samosa, chicken roll and doughnut from Treats. I suppose the advantage of not having much decent food on sale within very close vacinity of Tube stations, means that you get fewer people eating smelly food on it. If I'm particularly starving and have a had a few drinks I've been known to forget Tube etiquette and tuck into some fried chicken. I try to keep it in the bag as much as possible when I'm not gnawing on it, but am still aware of the evil stares of people and subtle nose wrinkling going on. 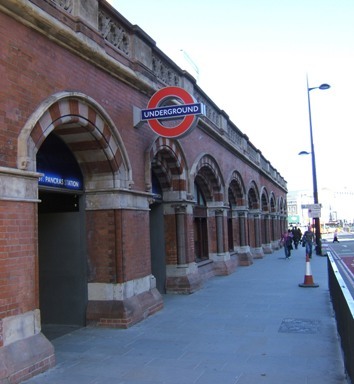 IanD's "Guess Where Tube quiz" got a great response with many of you guessing the location of various stations which is quite hard when the station names are blanked out. There were 12 stations in total one for each Underground line. 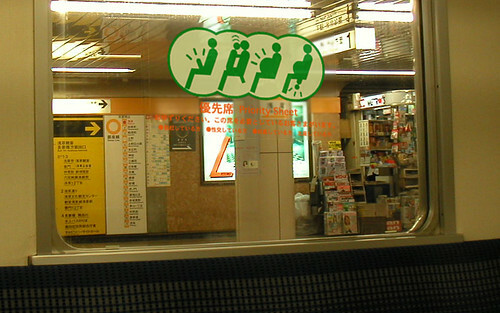 5 stations are in Zone 1. 6 stations are in Zone 2. One station is in Zone 3. 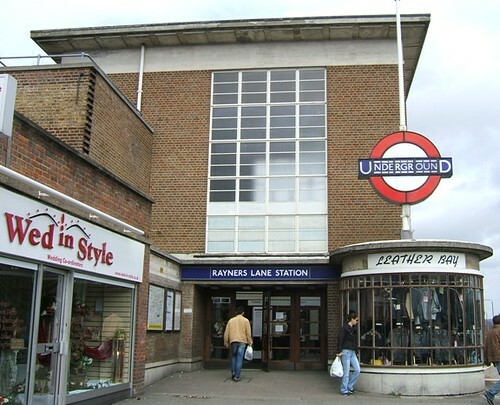 One station is in Zone 5. The additional clue that I didn't give, just to make it harder, is that they are all on interchanges. No one guessed all twelve correctly but Rich and Chz got 11 stations each (quite an achievement), miles away got 8 and John F got 7. Many thanks again to IanD for devising the quiz. Great idea and yet pretty difficult to solve.